Not to be confused with Halloween, Day of the Dead — known in Latin America as Dia de los Muertos — runs from Oct. 31 to Nov. 2, combining the ancient Aztec tradition of celebrating the lives of one’s ancestors with the Catholic All Saints and All Souls Days (Nov. 1-2). Chicago’s Latino community is bringing its A-game with art shows, dances and other Day of the Dead-themed events. 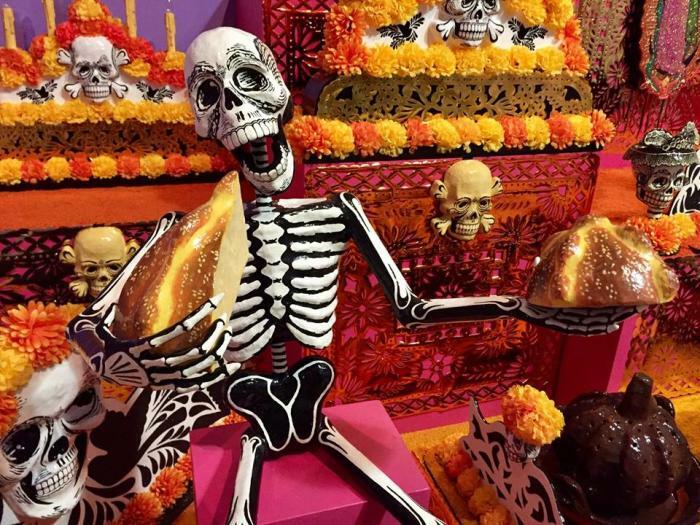 The festivities kicked off on Sept. 21 in Pilsen at the National Museum of Mexican Art (1852 W 19th St), with the opening of two new exhibitions: Dia de Muertos: A Spiritual Legacy and !No se olvida! Remembering the Tlatelolco Massacre. Dia de Muertos features “one-of-a-kind displays of traditional and contemporary works of art” in remembrance of the departed. The installation includes objects placed on a ritual altar from the Parkland, Florida community, where a mass shooting claimed the lives of 17 people this year. The exhibition runs through Dec. 9. !No se olvida! Remembering the Tlatelolco Massacre commemorates the 325 students and civilians who were killed by Mexican police and military on Oct. 2, 1968, in Mexico City’s Tlatelolco neighborhood. The exhibition runs through Jan. 20, 2019. The National Museum of Mexican Art’s Auxiliary Board is holding its annual Day of the Dead ball on Saturday, Nov. 3 from 6 to 10 p.m.. Attendees enjoy live music, delicious Day of the Dead treats, beer and cocktails, and will have the chance to win exciting prizes. Proceeds go toward Museum programming. Tickets are $125 advance/$150 at the door. The Day of the Dead festivities literally run through Chicago’s Pilsen neighborhood on Saturday, Oct. 27, with the 11th Annual Carrera de los Muertos/Race of the Dead. The 5k run starts at 8 a.m., and runners who finish in the top three of their age divisions will win a one-of-a-kind Dia de los Muertos sugar skull. The race is organized by the United Neighborhood Organization (UNO) to promote health and wellness. The 2017 race attracted over 6,000 runners and spectators. Those attending are “highly encouraged” to dress in Day of the Dead costumes. More information about the race is available here. Insider Tip: The National Museum of Mexican Art is located in Chicago&apos;s Pilsen neighborhood, rich in Latino art and culture. This is definitely a hot spot over the Halloween season, and especially during the Day of the Dead celebrations. Those looking to get into the spirit and wanting to explore their artistic side can check out Pinot’s Palette, 2768 N. Milwaukee Ave., where patrons are invited to paint and sip wine in Logan Square. On Nov. 2, painters will be given the lesson Sugar Skull Beauty. The sip and paint parties are “no art experience required” events, where patrons learn to paint a figure in traditional Day of the Dead regalia.